This piece has a lengthy history. 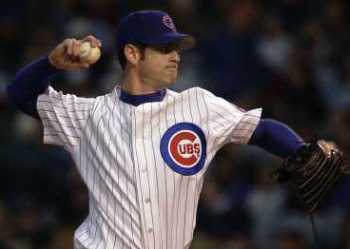 I first put it together in 2007 thinking that Hyperabduction -- a pitching arm side elbow at or above the level of the shoulders at foot plant -- was a primary problem; that it could cause problems on its own. I then realized that, in the pitchers who did break down as expected, their problems were more likely due to the Inverted W causing a Timing problem. As a result, I put this piece on the back burner. However, I continue to see pitchers with VERY high back elbows, and I know high pitching arm side elbows at foot plant are still widely advocated and taught, and that tells me that Hyperabduction is indeed a primary problem. I revisted the topic of Hyperabduction in 2016 due to two incidents. The first was the news that Bronson Arroyo had an 80% tear in his labrum. The second was my correct prediction that Matt Harvey was dealing with Thoracic Outlet Syndrome due to his high pitching arm side elbow delivery. Get the Back Elbow Up? 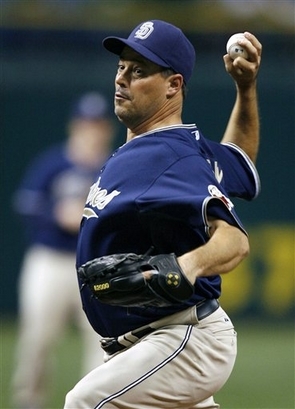 Some people believe it is critical that pitchers get their Pitching Arm Side (aka PAS) elbow up ABOVE the level of their shoulders at the high-cocked position because they believe that this will help to raise the pitcher's arm slot. I believe that doing this, which I call Hyperabduction, leads to problems with the rotator cuff and/or the Labrum. 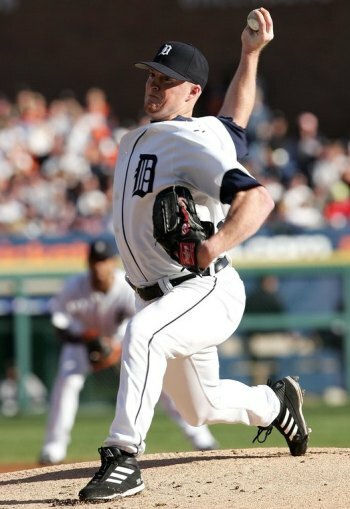 What's more, because a pitcher's arm slot is a function of their shoulder tilt and not the height of their PAS elbow at the high-cocked position, following this advice with do absolutely nothing to alter a pitcher's arm slot. 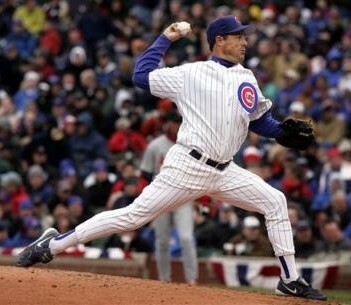 I believe that, after they break their hands, pitchers should always keep their PAS elbows BELOW the level of their shoulders, as Greg Maddux is doing in the photos below. 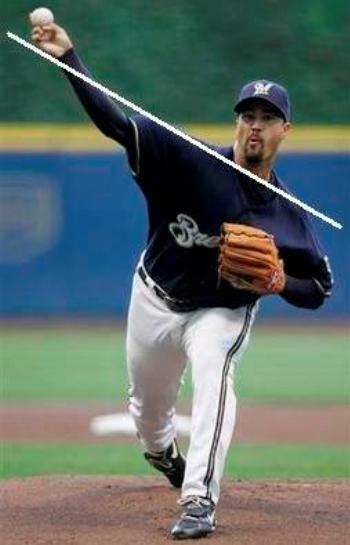 If they want to raise their arm slot, then they should focus on tilting their shoulders at the release point as Jeff Suppan is doing in the photo below. Notice how his PAS elbow is just below the level of his shoulders (the white line). 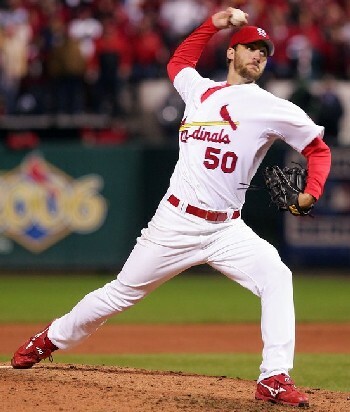 I believe it does a pitcher no good, and may do a great deal of harm, to try to get their PAS elbow up as their PAS upper arm passes through the high cocked position. If you look at these frames from a high-speed clip of Bronson Arroyo, you can see two things of concern. First, notice how Bronson Arroyo breaks his hands with his fingers on top of the ball. He then holds that fingers on top of the ball position through his arm swing. As a result, as he goes into Foot Plant, Bronson Arroyo is pointing the ball at second base and in a position of Premature Pronation, which I believe created the need for his Tommy John surgery. What's worse, at Foot Plant Bronson Arroyo's PAS elbow is well above the level of his shoulders. As is explained below, it is theorized that this can cause labrum problems. 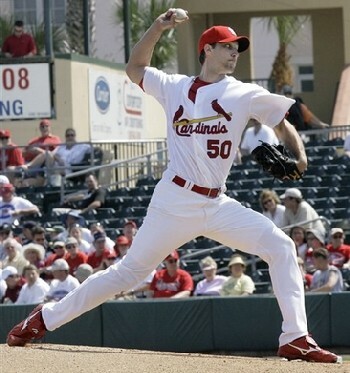 Below are pictures of pitchers who Hyperabduct their PAS upper arms and who I believe either are due for -- or in the case of Freddy Garcia, Mark Prior, and Billy Wagner are already experiencing -- shoulder problems as a result. I used to be a big fan of Freddy Garcia. I still like how early he gets his PAS arm up into the high cocked position. However, his recent shoulder problems have led me to re-examine his mechanics and what I have come to notice is how high his PAS elbow gets. I believe that this could be related to Freddy Garcia's recent shoulder problems. Chris I am an orthopedic surgeon, and would like to offer you a theory on why the inverted W is bad for the long-term health of the shoulder. In the position of hyperabduction, elevation and extension of the distal humerus above the shoulder (inverted W) the inferior glenohumeral ligament is placed on stretch. The humeral head must lever against it to advance the arm forward. This ligament is the primary anterior stabilizer of the glenohumeral joint with the arm elevated (i.e. pitching). In other words, this position places this ligament under tension, then it is levered against in order to throw. This eventually will either loosen the shoulder, or tear the anterior labrum. It should be recognized this ligament is under stress during the "normal" delivery. If you traumatically dislocate your shoulder, this ligament is a key part of the pathology. Shoulder instability in turn leads to impingement, and other problems. Conversely, when the elbow is below the shoulder, this ligament would not be as stressed. Also, the specific use and timing of the muscles about the shoulder is critical. They have done muscle activity studies during throwing, and there are distinct differences between amateurs and professionals. There is also evidence for muscle use differences in the healthy shoulders, and the ones that aren't. I'm not sure he's exactly right about why this is bad, but what he says is interesting enough to make me think I'm on to something.